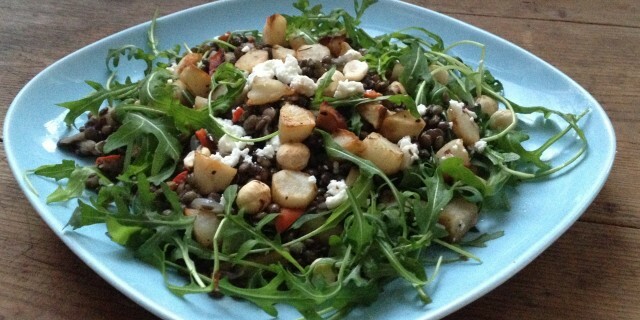 This warm Jerusalem Artichoke Lentil Salad is so delicious and very easy to make. I love adding Le Puy lentils to my salads. They have an earthy, delicate flavour and they hold their shape during cooking. They also combine really well with the earthy, nutty and slightly sweet flavour of the Jerusalem artichokes. I have roasted the Jerusalem artichokes in the oven with a little drizzle of balsamic vinegar and olive oil which enhances their natural sweetness. I also love that they stay soft on the inside and get a nice, caramelized crunch on the outside. The Mustard Honey Balsamic dressing is sweet and pungent, which is just perfect to balance of the earthiness of the lentils and Jerusalem artichokes. The sweet, buttery flavour of the roasted hazelnuts and the hazelnut oil in the dressing add to the rich, nutty flavour of this salad. I love to top it off with some fresh leaves of bitter peppery arugula. This salad truly has it all when it comes to texture and flavour. You can serve it up as side-dish or as a starter to your dinner. I always make a little extra and eat it cold the next day as a light lunch. Line a baking tray with baking paper and lay out the Jerusalem artichoke in a single layer. Drizzle olive oil and balsamic vinegar on top and season with salt and pepper. Roast for 35-40 minutes or until soft and caramelized. Heat olive oil in a small saucepan. Add the chili pepper, shallots and garlic and cook for 2-3 minutes. Add the green lentils, the thyme sprigs, bay leaf and vegetable stock. Cook lentils until al dente (Le Puy will take only 20 minutes, other green lentils can take up to 45 minutes). Drain and allow to cool down. As the Jerusalem artichokes are roasting, add the hazelnuts to a non-stick baking tray. Place in the oven for 8-10 minutes, stirring every once in a while. Serve the lentils with the roasted Jerusalam artichokes, fresh arugula, soft goat’s cheese (optional) and roasted hazelnuts.